For generations, Midtown Montgomerians have enjoyed Oak Park with its interesting and diverse history. In 1886, the Capital City Street Railway Company purchased 105 acres from the Hall’s Woods Tract to serve as a city park adjacent to the first streetcar suburb of Highland Park. Soon after, in 1889, the Highland Park Improvement Company purchased this property to include in their neighborhood development plans, but within 10 years, city officials had been persuaded by Mayor John Clisby to re-acquire (for $25,000) a 45.5 acre section of the tract. Today, Oak Park is bound on the north by Lake Street, on the west by Hall Street, on the south by Palmer Avenue, and on the east by Forest Avenue. The expansion of the Capital City Street Railway allowed for Montgomerians to travel the mile and a half from Court Square to Oak Park. 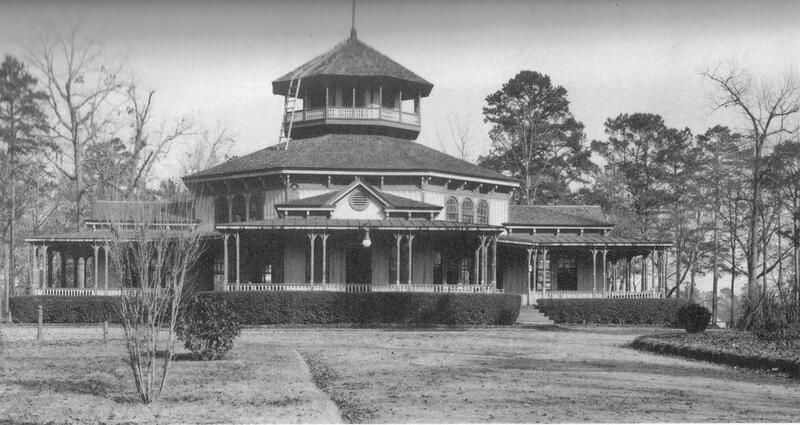 With the construction of the main pavilion, its encircling porch became the scene of many dances, parties, and even political gatherings. The large ornate wooden structure was nestled on a rise in the trees and overlooked the winding paths, picnic areas and playground, making Oak Park a very popular subject for postcards of the day. By the early 1930s, Oak Park was accessible from all over the city by bus lines, and the emergence and availability of the automobile made driving through Oak Park a popular pastime. In the 1930s, the prestigious landscape architectural firm of the Olmstead Brothers produced a preliminary plan for suggested improvements to Oak Park incorporating the existing circular drive with a large wading pool, a swimming pool with a grandstand, clay tennis courts, croquet lawns, playground, and a small zoo complex. The earlier ornate wooden pavilion was demolished, and in 1937, a new Tudor-style building was constructed of granite blocks and today houses the City’s Leisure Services Division. This new building was situated at the main entrance to the park, which was then at the intersection of Forest Avenue and Park Place. The back entry to this main building opened to a formal garden, accenting a reflecting pool to the open vista leading to the swimming pool. As Oak Park expanded, a zoo began to develop in the northern end of the Park. Several species of monkeys lived on Monkey Island, an area of stacked rocks surrounded by a moat in which ducks and geese swam. An arched rock bridge led to housing for other animals: alligators, bears, rabbits, mountain goats, raccoons, and a fenced expanse for deer. The large swimming pool with a modern filtering system was covered on one side by a grandstand, and a bathhouse with showers was located nearby. The pool was open seasonally to the public every day from 6:00 a.m. until 10:00 p.m. The more shallow wading pool for children ages three to ten years had a field house for dressing and was located behind the main building. The six well-graded lighted clay tennis courts were available and the amusement area was equipped with mechanical rides such as a merry-go-round, airplanes, and a train with several hundred feet of track. M. B. (Pop) Myers opened his popcorn business in July of 1922 at the east gate of Oak Park. His friend and neighbor Mr. Bogacki built Pop a structure to sell his popcorn, and he became a permanent fixture at the park until its closing. Pop was best known for his popcorn and his shake-ice Cokes, a frozen Coca-Cola in a six and a half ounce glass bottle. Pop Myers remains a legend even to this day. Building is original social center, photo 1930s, Gorrie/Landmarks Foundation collection. After almost 60 years as a local landmark, the gates of Oak Park were closed in January of 1959. In September of the previous year, Federal Court Judge Frank Johnson ruled that the City’s racist recreational policy was unconstitutional. Instead of integrating, officials chose to shut down all of its parks. At Oak Park, the swimming and wading pools were drained; the lion, bear, alligators, peacocks, monkeys, and deer were either given away or sold. The gates of Oak Park were closed and locked. In February of 1965, the Montgomery City Commission voted unanimously to reopen Oak Park and the several remaining closed neighborhood parks from sunrise to sundown. Mayor Earl James engaged a landscape architect to transform Oak Park into botanical gardens, as its location at the foot of the newly proposed interstate would eventually afford it as a tourist attraction. Sports were relocated to the new Lagoon Park facility and the City then sought out 100 to 150 acres elsewhere to purchase for what is now the Montgomery Zoo. The swimming and wading pools remained closed and were eventually filled in. With the reopening of Oak Park, the Montgomery City Commission decided to allot $180,000 from the 1965-66 general fund for construction of a planetarium to compliment existing plans for botanical gardens. With design drawings done by Pearson, Humphries and Jones, Architects, the construction contract was awarded to Andrew and Dawson Construction Company. Upon completion, the planetarium was dedicated to Mayor W. A. (Tacky) Gayle. 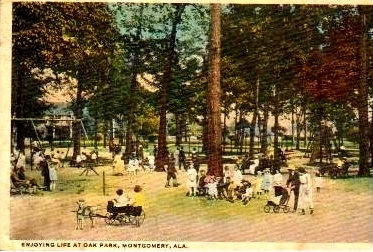 Today Oak Park still remains at the heart of Midtown Montgomery. The Park has weathered many encroachments to its existence. Its location in the center city affords it traffic from adjacent neighborhoods, commercial areas, and the Interstate network. Many of the early buildings and much of original landscaping remain. Monkey Island survives today as an integral part of a nature walk and meditation garden. The pool bath-house now provides restroom facilities adjacent to the horseshoe pits shaded by some original crape myrtles. Gayle Planetarium now operated by Troy University is a popular field trip destination and playground areas are the site for school visits, birthday parties, and neighborhood children. Efforts continue to maintain the colossal tree canopy, to replant as needed, and to educate with a tree labeling program. The towering pines and hardwoods continue to welcome those who visit Oak Park. Additional history of Oak Park can be found in this book by Heather Trevino and Linda Pastorello. An organization I belong to had annual picnics in Oak Park, but the restrooms became so disgusting that we now have our picnics elsewhere. One member stated that when she had to “do her business,” she drove over to Jackson Hospital to use the facilities, then drove back to the picnic site. I will go on record, I love Oak Park! I don’t remember how old I was the first time I went there maybe the age in my facebook profile picture. Years ago when the zoo was still located in Oak Park, as you stated the monkeys were housed on an island surrounded by a moat. One day the monkeys escaped off the island and ran across interstate 85 after scaling the fence surrounding the park. Truckers who traveled on the north to south route from I-85 to I-65 south saw these monkeys and announced over their CB’s this looked like a “monkey town.” Although there have been some people claiming the name comes from the racial make-up of the city, that if false. To some of us older folks, we can still remember the zoo, the pool and tennis courts the Park had to offer. Those were some of the best days. Refering to the intersection of Forest Ave. & Park Place mentioned, can I assume that the Park Place in Cloverdale used to extend all the way to Oak Park, or not?